LEAPing Lizards.. have I got a GIVEAWAY for you!! To make it even more appropriate, I'll be giving away the set "Sweet Celebrations" ... because I am oh-so-sweetly celebrating over here! 2) Write your answer in the Comments area below! That's it! I'll draw randomly from all the entrants and pick one winner on Monday March 3rd. If you need a hint.... you'll find a clue somewhere on the main page of this blog. GOOD LUCK! Did you like the ones I posted yesterday? Well, I have LOTS more where that came from! In fact, I think I'll take the pressure off myself from having to stamp something fun (since I'm swamped to the gills preparing for the big International Home & Garden Show next weekend) and just show you all the lovely things I saw while in Palm Springs last month. p.s. Don't forget to take your chance at my big Leap Year Celebration Giveaway! More samples from the new Occasions Mini Catalogue! P.S. For Canadians, please note that the 7% reduction pricing WILL be in effect for this catalogue, plus all the stamps are die-cut. WOOHOO! Free "Styled Silver" Hodgepodge Hardware! The Occasions Mini Catalogue is chockful of good things, some of which happen to be the awesome new Styled Silver Hodgepodge Hardware pieces! I'm think I'm like a magpie, in that I do so love shiny things and usually want to horde them for myself in my little stamping nest. But for the next few days, I'm GIVING THEM AWAY! For every $70 in orders you place between now and March 1, I'll include a free sampler package of everything in the new Hodgepodge Hardware... so you can start playing with it right away. THE ORDER WILL BE PLACED ON SUNDAY MARCH 2, so you can include items from the "Occasions" mini catalogue in your order. Please note, this offer is only valid through me and for Stampin' Up! orders shipped in Canada. Here are a few cards I created earlier tonight using the Hodgepodge Hardware as well as other special items from the new mini...can you tell which ones they are? (please click on images to enlarge details). p.s. Don't forget -- Sale-A-Bration is still on so each $70 order also means you get to choose something from that mini for FREE too! "Summer Days" Flip Flop Album class! Here is the Flip-Flop Album we will be making on Thursday night, using the "Summer Days" Simply Scrappin' Kit in the current catalogue. There was NOT STAMPING INVOLVED... (gasp! ), just cutting, pasting and of course I added some fun Rhinestone brads to bring the bling. I only have space for 2 more people at this class, so please RSVP right away if you'd like to attend!! as always, lease click on images to enlarge! 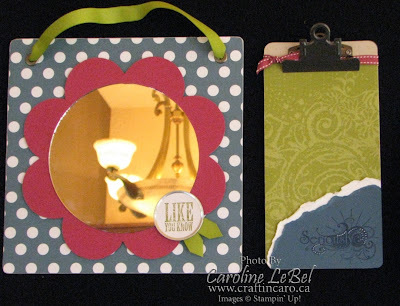 Here are 2 of the projects that we made Saturday evening at our "Canadians, INK!" team meeting, both of which utilize some items from the upcoming "Occasions" Mini Catalogue that you can begin ordering from on March 1. The first is a tent card that uses the new textured die-cut Blooms, the new "Tart & Tangy" fruit stamps set plus the matching "Summer Picnic" Designer Paper. Mini card #2 uses rub-on's in both white & black from the new "A Perfect Day" package, plus a small ribbon slide from the "Styled Silver" Hodgepodge Hardware. Cutie-patootie! I'm at the studio today and in a spring cleaning-kind of mood.. I'm looking forward to tackling the insanity which passes as my office. Hopefully I will have time to start in on the studio area too; who would have thought that giving up caffeine and sugar would give me MORE energy??? Go figure... and check in on me again around 2pm to see if I've faded away into nothingness. Here are the final 2 cards that we made last night at the "Embrace Life" class - enjoy! Okey doke, here's the 3rd of 5 cards that we are making tonight, and it's a Long-Tall-Sally of a card (please click on card image to enlarge). I broke out my new "Styled Silver" Hodgepodge Hardware kit, which is coming out in the new "Occasions" mini catalogue next month. I used the silver ribbon slider to go across the thin velvety ribbon from the Sherbert Ribbon Originals, thus giving an easy but elegant touch to this watercoloured card. I'd best get going to finish chopping the cardstock for tonight's class... see you back here tomorrow! Melissa's Hostess Gift -- and yet another way to use Rub-ons! Here is the hostess gift I gave to Melissa last night at her stamping workshop... it's a hinged tin filled with chocolate nuggets. YUM! Who doesnt like chocolate?! I got the idea from a tin that Dannie Grave made at Leadership, but for mine I incorporated the SAB Rub-on's right on the lid, since Melissa wanted to see some examples of items made with them. It was super-easy, and I wrapped the belly band and nuggets using the Ginger Blossoms designer paper, one of my absolute fave sets of papers these days. I just got a massive box with 100 of these little tins in, so I'm looking forward to using them in an upcoming stamp camp as well as to make extras to sell at the International Home and Garden Show in a few weeks. Let me share with you another card we'll be making Friday night at the "Embrace Life" card camp. 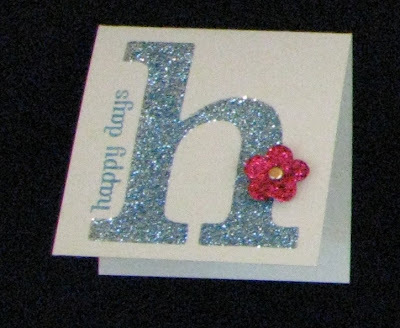 It's a beautiful card using the "Faux Diamond" technique, which uses Heat & Stick powder combined with Dazzling Diamonds glitter so a super dazzling effect. This card by Danelle Henry was one of my favourite swap cards from Leadership, and I knew right away that I'd be including it in tomorrow's class. 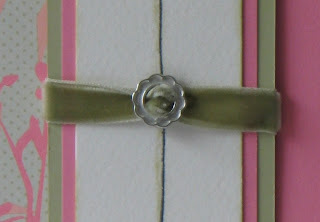 It even uses Blush Blossom, a colour that I think is underutilized by many stampers. Tomorrow I'll share with you the projects we'll be making on Saturday night at our next "Canadians, INK!" team meeting. If you've ever thought about becoming a demonstrator, why not join us for the evening just to check things out? I'd be happy to have you as an extra-special guest for the night -- please RSVP if you are interested. Here is a card that I received late last week from Sarah at the Stampin' Up! head office. She and I had worked together in January, leading up to when I assisted in presenting a Teleconference on recruiting. She was such a peach to work with, and I was so touched to have received this "Simply Said" thank you card. Isn't it adorable? I'll also take a quick moment to welcome my 3 newest demonstrators: Janet, Melinda and Monique. THANK YOU for joining my team & our "Canadians, INK!" stamping family. I'm thrilled to have you with us! He brought it over to me early in the day and when I tried to stop him, saying he needed to wait until the evening when I gave him HIS card, he insisted that I take his now. I must have looked at him strangely, wondering why I needed it right away, and he said, "in case you want to put it on your blog!" LOL! That Brent, such a show-off. Otherwise, I had a lovely Valentine's evening; we watched "Amelia" with La La La Human Steps (our favourite Canadian dance company - see clip from the film below) while enjoying a nice Pinot Grigio, cranberry brie and then creme brulée with fresh raspberries. Yum! Free Red Ink Pad or Paper! Happy Valentine's Day, my blogging friends! First, let me start off by sharing two Stamper's Club projects we made this month, both of which could be given as valentines to friends or loved ones. The first was made using the "Caught in Crystal" technique, using the "Always" set I received at the Manager's reception in Palm Springs. It is a 4.25"x4.25" size card, so it still fits in a standard envelope. Any $70 order placed with me between now and Monday February 18 will not only qualify for a free Sale-A-Bration stamp set or rub-ons package, but you'll also get your choice of any RED Classic ink pad or 8.5x11 paper package FREE. Simple quote the special "CUPID" when ordering to get your free gift from me! Please note, this offer is only valid in Canada -- sorry. HAPPY STAMPING, now go out and spread some love today! Have those of you who live in the GTA finished shovelling yourselves out yet? Whooo-weeee... that whipping ice pellets walk-home-from-school yesterday was brutal! I'll be happy not to deal with that kind of snowstorm for a while, thanks, but apparantly there's more to come this weekend. DON'T SHOOT THE MESSENGER! 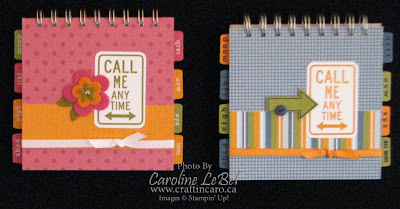 Until we next chat, happy stamping! p.s. please come back tomorrow for my Valentine's Day special -- only available to blog readers!!! You can even use them on your accessories, like ribbon & buttons! 1) For best results, cut out your Rub-On image and remove it from the backing sheet. Lay the image on a flat surface, and rub it lightly with your finger to hold it in place. Then firmly rub the image with your bone folder or the wooden stick (included with the Rub-Ons) to transfer it to your project. You’ll know the image has transferred completely when the image becomes lighter on the transfer sheet. Pull up slowly on the transfer sheet, being careful not to slide it. If the image hasn’t transferred completely, simply lay the sheet back down and try again. 2) If you want to transfer Rub-On images to a small embellishment such as a button, you may want to transfer the image to the embellishment before you adhere the embellishment to your project. Stick the embellishment to a smooth surface, such as a cellophane bag, using SNAIL Adhesive. Trim the image from the Rub-On sheet and lay it over your embellishment. Rub your finger over the image to help hold it in place, then transfer the image completely using the wooden stick. 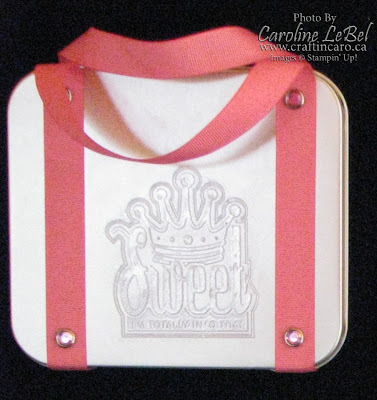 Peel the embellishment off the bag and adhere it to your project. 3) You can remove Rub-Ons from most surfaces with our Adhesive Remover. 4) Make sure you store your Rub-Ons with the paper backing or your images will come off where you don’t want them to!! 5)If you need to clean the item the Rub-On is adhered to, wipe it gently with a damp cloth.